Aberdeen remembered all those who have lost their lives, been injured or made ill at their work at a moving and well attended Workers’ Memorial Day service on 28th April. Opening the ceremony at the Persley Walled Garden in Aberdeen, Kate Ramsden, President of Aberdeen Trades Union Council, extended a particular welcome and deepest condolences to the family and work colleagues of Ian Walker, the worker who lost his life in the construction of the third Don Crossing. 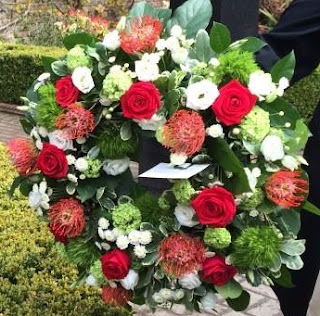 Kate said, “This will be a very poignant service as we mourn the deaths of three workers, including Ian, killed at their work in a three week period in Aberdeen and Aberdeenshire earlier this year. “In coming together today we mourn all those, like Ian, who have lost their lives doing their job. Following a minutes silence, Ian’s daughter Kirsty and his two sons, Andrew and David laid the wreath on behalf of the ATUC. Councillor Angela Taylor laid the wreath for Aberdeen City Council on behalf of the Lord Provost of the City. All the speakers paid tribute to the Walker family for attending the service today, and for shining the light on why the fight goes on to to ensure that no one loses their life or health at their work. George Ramsay of UCATT who has supported the Walker family told those gathered that he had travelled from Dundee that morning, “a journey many Dundee construction workers make daily to the North East of Scotland. “But our thoughts today are truly with the family of Ian Walker, who failed to make the return journey to his family and who never got the chance to say goodbye. “Today, the length and breadth of Britain, these events are happening because still construction workers are not making their journeys home,” said George. Councillor Allan told those gathered that Aberdeen had seen its fair share of the tragic loss of people killed at work but that this should never be an expected part of working life. “It is estimated in the UK that at least 20,000 people die from injuries and illnesses realted to their job every year. That’s at least 20,000 families missing more than just a breadwinner – missing their father, son, husband, mother, daughter and wife. “That’s why we all have a responsibility to ensure that health and safety is seen as more than just a nice add on to everyday business or a bureaucratic tick list to be checked,” she added. However, government has an important job too, said Lewis. “It’s important to have effective health and safety legislation and a properly resourced Health and Safety Executive. George Hood of Balfour Beattie then said a few word to pay tribute to Ian Walker, a popular worker, liked by all, demonstrated by the numbers of his colleagues attending today's ceremony. He pledged to ensure that if lessons needed learned from the tragedy of Ian's death then the firm would learn them and take action to prevent further tragedies. UCATT’s Steve Dillon told those gathered that Workers’ Memorial Day is a day when we come together to remember all those who have been killed, maimed or injured at their work. “And it’s a day when I get angry,” said Steve. “Remembering the thousands of construction workers who have died since I began in the industry. Whose only crime was to go to work. “And who died because companies put profit before workers safety,” he added, slamming the “sickening complacency of employers, the HSE and the Government” and cuts by this government to safety laws and the Health and Safety Executive which will have had its resources halved by 2020. “One death is too many,” said Steve. “The only people dedicated to keeping workers safe are the unions,” said Steve calling for organised workplaces with a health and safety rep on every construction site. Steve ended with a powerful and angry poem written many years ago to support corporate killing legislation, and just as relevant today. Who’s the colleague who’s spread on the ground? A spooky shiver runs from head to toe. Some here have felt it – they will know. What was he doing? Who was he with? The corp looks around there on the sniff. His workmates they all gather around, huddled together, eyes onto the ground. As the blue light flashes and rushes away, she still doesn’t know the tragedy that’s unfolding that day. The MD arrives as if by surprise. On a site first seen by his own eyes. Who is in charge, does he not know? It’s him ofcourse, with a tale of woe. Her home phone rings as she’s preparing the dinner. Your man’s in the hospital, we couldn’t tell you sooner. Who made the call no-one knows as the corp asks the questions as they wouldn’t know. A get-out clause is what they want: someone to blame for this possible haunt. No thought or care for a man they don’t know. It’s a big contract or didn’t you know? They need some answers and they need them quick. They make me sick. This work must go on and cannot pause, as they can’t afford a penalty clause. As his wife arrives at the hospital, you know I’m sorry to tell you, he passed away some hours ago. It cannot be – you must have it wrong – he was only at work, how can anything go wrong? She screams, she screams her husband’s name. He only worked in the construction game. It must be wrong, it must be wrong,. The poor woman stands there on her own. The site foreman sulks as he turns away. I’m not paid for this, and he slips away. Some months later as she comes out of her daze, the court case looms – some justice she says. Five days on, the verdict’s returned: a six grand fine and a license to kill. Killing our workmates, our fathers and sons, husbands and children, we need something done. The corp looks around and you know what they say? That’s not bad – fined a day’s pay. They hide behind that corporate veil, and we all know here, it should have been jail. But let’s remember their day will come, as the UCATT fight comes to the front. The people I have mentioned multiplied by three come to vast numbers, or can’t they see? They must stop killing our family tree. Times this by 70, the Government must know. We need some action. They’ve been too slow. We all want the Bill and we want it now – the corporate killing legislation or they will go down. And when it’s delivered we’ll soon find some justice for her and others her kind. As the door slams shut and they’re facing four walls, they’ll have time to think but too late for them all. And then they will remember as they plan the next job, it’s safety first and not cash for the mob"
Photos by Tommy Campbell and Laura Macdonald.